While doing some, er, online shopping this weekend (I was actually looking for a child-friendly nativity set, inspired by one of your ideas!) I found this. And I had to have it for my Vivi. Her name is Baby Stella and she comes with blond hair or black hair. For some reason, I liked the one with black hair better. And for me Vivi Baby Stella, I got a little feeding set. The pieces attach to her mouth with magnets. Call it a late birthday present. Or an early Christmas present. Whatever you call it, I’m taking it all to China with me for Vivi. Next, I took Jane’s advice and bought some Magna-tiles for my kiddos. The reviews were what sold me… people obviously love their Magna-tiles. I got this set for Shepherd. He loves cars. And he loves taking things apart. He should really love these. And I got this bigger set for, well, I’m not sure who it’s for. Sometimes I buy gifts for one child and they end up going to another. But I think several of my kiddos would be pumped to open these on Christmas morning. 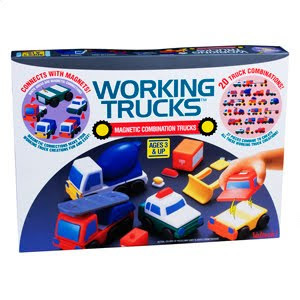 And the fact that several of my kids might actually play with these together… well, double bonus. I also bought these for my husband. They’re not really for Christmas, because I suspect he’ll rip into the box as soon as it arrives. My husband loves shoes. And it’s his only weakness, if you could even call it that, so I indulge him whenever he has a hankering for a new pair of shoes. After all, he does earn the dough around here. They’re not nearly as cute and cuddly as Vivi’s gift, true. 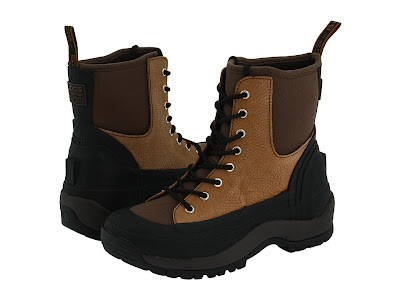 But if any of you are looking for a ruggedly handsome (and waterproof) pair of boots to wear while snowblowing and/or chopping wood in sub-zero temperatures, I thought I’d share where I got them. There you have it, my weekend shopping done straight from my computer chair, snugly ensconced in my green-carpeted office. Holy cow!!! I just love "Baby Stella"!!!! She is so adorable!!! I have been pondering about getting a dolly for Avery…This one seems just perfect!!! 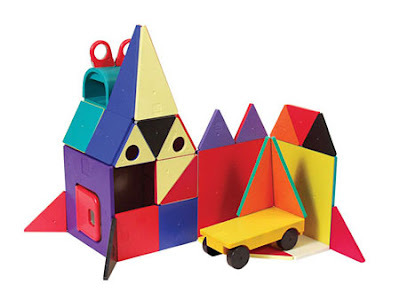 And those Magna-tiles…I believe this toy would be something that Shea would play with until the cows came home. She loves to build and create all kinds of structures. Too cute!! I hope you found the Nativity. I ordered the Fisher Price Little People Nativity. This is the one we are putting up this year and its perfect for our 2 year old. I LOVE those magnet tiles. We use those in preschool and they are always a huge hit! I wish I would have known about them for Ben. 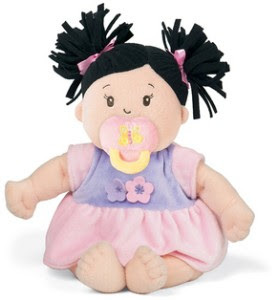 Did you know you can go to Babylandgeneral.com & order an Asian Cabbage Patch Kid? You can also pay a little extra & personalize a birth certificate with the name of your choice. After all, CPK's are "adopted" kids too!! Baby Stella is super cute! Also…I thought just my husband had the shoe fetish. John says shopping for shoes makes him "happy"…? I love your blog!! I've been following silently for a while, but had to comment. We bought the Baby Stella – Peach with the Paci for our youngest daughter. I don't have any adopted children, but we are starting the process soon. We will be doing domestic for special needs though because my age doesn't meet international requirements. HEY TRU is out of stock BUT AMAZON has STELLA DOLLS sans PACI. I have that Baby Stella doll. Bought her for my niece, but decided she was going to need to "live" at my house. She loves playing with that magnetic paci! LOVE baby Stella!! Where did you find her, Stefanie???? Too cute! That baby is absolutely adorable!!!!!!! Love the gift ideas!! I do like to get the shopping done and just enjoy the blessed season! We are going with the American girl dolls for Sarah. Not sure what we will do for Anna?? She may love Stella! Keep posting the gift ideas! I love it!! Both my girls have Baby Stella! We LOVE her!!! (especially me) She is wonderful! So squoosy……she is precious! Also, there is a Little People's nativity set. It's adorable! The girls can play with it…and no one has to worry about breakage!! Love Baby Stella!! Must have one for Rachel, although it will be a late Christmas present.. Try fisher price for the nativity set. We have the little people one and my kids (all of them age 13-1) lay with it. You can also tell the story while playing and they will listen!!! I agree with the others on the Fisher Price Little People Nativity. We love ours. Doesn't get put away till almost Easter, but oh well 🙂 Also I've seen a veggie tales nativity set locally (Fleet Farm)that is very cute. Piper has Baby Stella and loves her – well, maybe I love her more! Ok now I am going to have to buy Baby Stella for my little adopted one! It is perfect to take to China (if we ever make it there, lol). I guess I will get her the black haired one and get my other daughter a blonde haired one. Yay! You will NOT regret the magna-tiles, we spend hours playing with them. Mads and I made a whole town today (church, houses, school…). We heart the Fisher price nativity too, I am itching to bring it out! Please put up reviews/pictures of the magna-tiles when you give them to the kids! They have those Magna-tiles at my girls' pre-school and the kids love, love, LOVE them!! They are always the most played with toy in the room.